FUNTANA is a small tourist resort taking pride about its rural tradition, beautiful countryside, fertile soil and rich sea on one hand, and the hospitality given to its guests on the other, making its guests understand that Funtana is the very fountain of friendship. Today, Funtana is a small town - why not? It is not just another village tightly packed around a castle and a church. 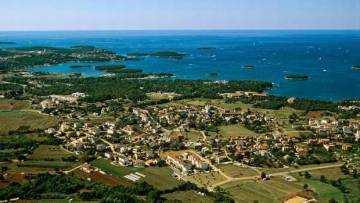 On the contrary, there are family houses built on both sides of the Porec-Vrsar road and you will have a hard time finding a family not providing accommodation during summer. There is hardly in Istria another example of a small town like Funtana - with so many good local restaurants, inns and tavern, arranged on such a small area. In confirmation of the outstanding results that Funtana has achieved in tourist trade is the fact that it has been declared the best small tourist resort on the Adriatic coast.